Ron Williams is the pastor of Church at the GYM in Sanford, Fla. As the Baptist church's name implies, Williams' congregation meets in a gym. Williams says the goal is to remove the "stained-glass barriers" for people who might not be comfortable in traditional church settings. "I think all the trappings of traditional religion can make it difficult for people to start coming," he said. "You can invite someone and they will say, 'I don't have any clothes to wear to church.' "
To make people feel more comfortable, Williams wears jeans. In the warm Florida climate, some members wear shorts. Other clothing types, from urban wear to biker gear, also are welcome. Comfortable is a theme that's becoming common among churches taking advantage of new, non-traditional spaces. Across the country, churches are springing up in unexpected locations — movie theaters, skating rinks, strip malls and old warehouses, among others — in an effort to welcome people who may not feel comfortable in more traditional settings. "We do a lot of things that are really different," lead pastor Steve Bentley said. 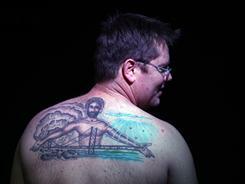 Perhaps the most different: The interdenominational church recently opened a tattoo parlor . "We want to be relevant to people's lives," Bentley said. "It wasn't anything like the other churches I had known," he said. "What we do is different. It's informal in a lot of ways, and it's very welcoming." Even outside the regular Sunday services, the churches find ways to engage people on friendly grounds. Church at the GYM holds its baptisms in members' pools — events that turn into big backyard barbecues. "It's exciting," Williams said. "Everyone cheers like we're at a basketball game."